The starting estimates are listed below on this page. 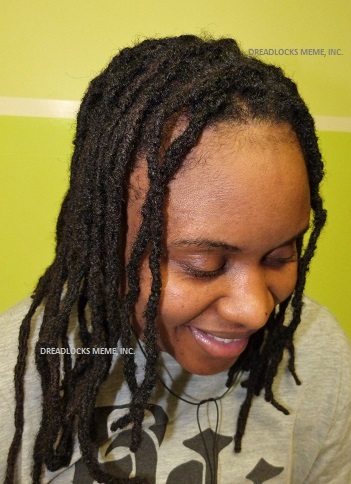 These Locs you see below in this picture are the client's real and existing locs. ABSOLUTELY NO GLUE WAS USED TO ATTACHED CLIENT'S DREADLOCKS. 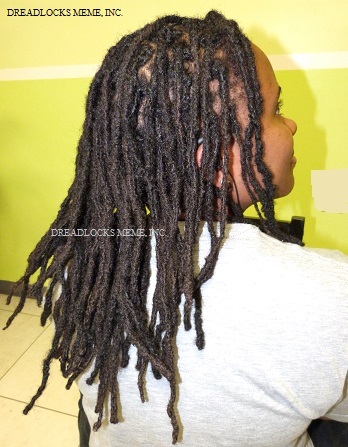 These are the client's Locs you see in the following pictures. She recently cut them off. She wanted new a look without her Dreadlocks. 4 months after cutting off all her Dreadlocks, she missed her Locs and she wanted to have them all back on her head. The client brought her small sized locs to Meme. The client requested to have her small size locs to be joined to a medium size and attached to her new growth. First her locs were attached and connected to her new growth. The new growth has been separated to for the attachment services. After attachment has been completed and washed. The reason it is important to wash the attached dreadlocks is to change the physical bond of the locs. After the Attachment and the wash. If client has the Palm-roll type of Dreadlocks. 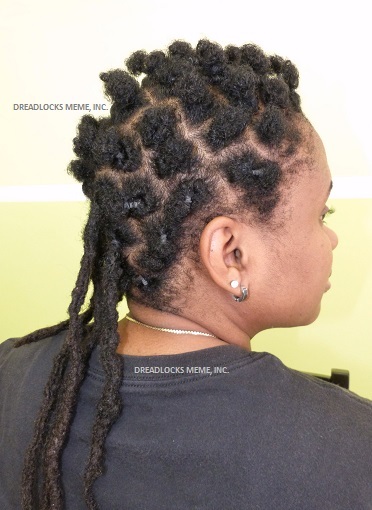 The attached Dreadlocks needs to be twisted and set on a style therefore the new batch of new growth will set for the locking process for the next several weeks ahead. Before attachment of the Dreadlocks. New growth has to match the size of the Dreadlocks. After Dreadlocks attachment. 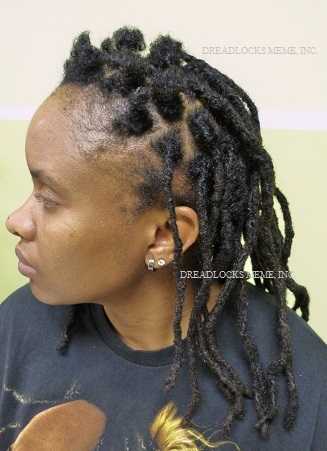 Client loc attachment has to be washed to change the physical bond of the newly attached dreadlocks. 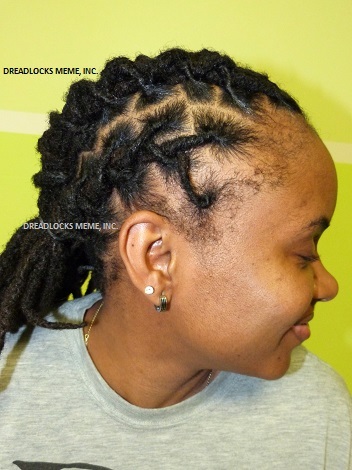 Estimates meaning it is the starting price for the Dreadlocks attachment services and the price can go up. 1. Size of the Dreadlocks. 2. Length of the Dreadlocks. 3. Condition of the Dreadlocks. 4. Dreadlocks services that has to be provided. Please be advised we do not negotiate our prices because we do provide quality work and we give our 210% of best quality dreadlocks attachment. 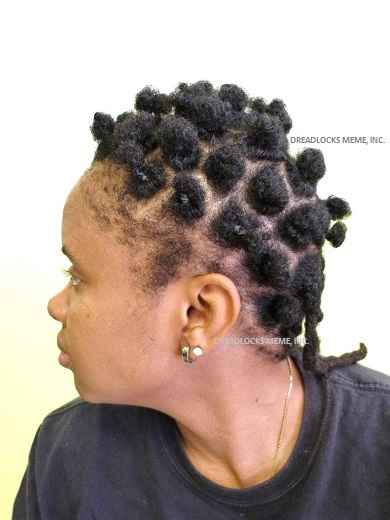 By preparing the new growth for the Attachment of locs. 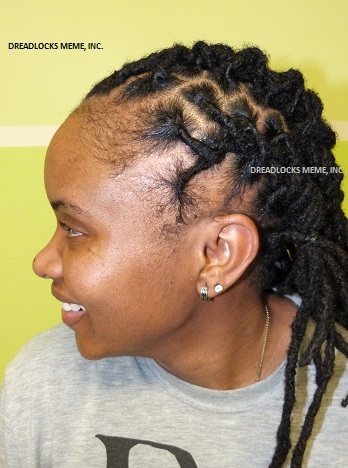 To prepare the foundation of the locs with client's own hair/new growth of about 3 to 5 inches long. It is all depends on the hair texture of client. Please be advised if the new growth of the client's hair is too short for the attachment service we will not be able to provide the attachment services. The Estimate for that service starts from $198.00 & Up. Meaning if you the client wish to make your Dreadlocks 1,2,3 and up to 4 size bigger than the original dreadlocks size. That can be done and the starting price is $587.00 & up. Meaning the width of the actual Locs. 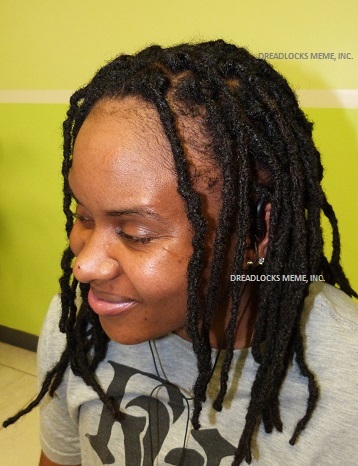 To prepare the Client's Real Locs . Meaning to prepare the edge of each locs to be attached at the base by giving that connection a natural look to the new attachment. We provide a limited amount of information. therefore our viewers will have an idea of what it takes to complete the Dreadlocks attachment services. Please be advised, we do not provide our secret recipe in detail how exactly we do the attachment. To attach every single Locs into the actual new growth of hair that was previously prepared to create the foundation for the loc attachments. The starting price is .........................$ 686.00 & Up. This type of attachment can take from 3 to 5 days long. It's all depends on the size and length of the client's Dreadlocks. If there is any additional work that is required. The Hair stylist/Loctician will inform client and ONLY if client approve to receive the services the hair stylist will proceed to provide that service. Please be advised any additional Dreadlocks services you the client request it will be an additional price. No additional dreadlocks services will be provided without the client's approval. We give 210% of our Dreadlocks services to our clients, therefore at the end of their services the client will have and leave with a smile on their face. 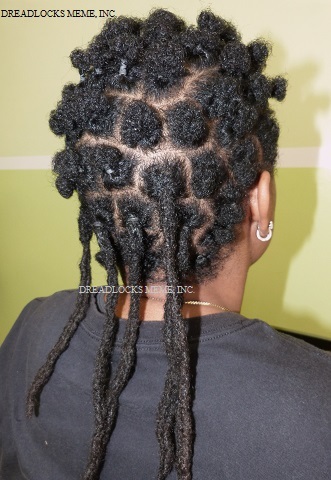 We work hard to meet each and every one of our client's goal and expectations in regards to their Dreadlocks/Hair. If we see we are unable to meet the client expectation in regards to their dreadlocks. We will be honest by informing the client we will not be able to provide the Dreadlocks services. Dreadlocks that was recently attached. The new growth at the base of the locs. client's hair locked for the next several weeks ahead. 4. How long you should keep this style? constantly. You can keep this style up to 2 weeks long. We strongly suggest up 3 to 4 weeks. set your new growth for the locking process. 6. The starting price is $146.00 & Up. Only If Dreadlocks services are accepted by the client then the consultation fee of $27.00 will be deducted from the final price.